Hallelujah – I cooked something that wasn’t stodge! This vegan leek, mushroom and spinach tart is something I’ve cooked before, at least a variation of, anyway. Usually when I make it, I cover it in cheese, like I’ve done previously on my leek, mushroom and goat’s cheese tart, mushroom, leek and mozzarella tart, and my courgette and tomato tart. I’ve got to admit, I had a bit of a pang when I took both mine and The Meat Eater’s tarts out of the oven, and The Meat Eater’s was covered in bubbling, oozing Cheddar but the pang faded as soon as I started eating. 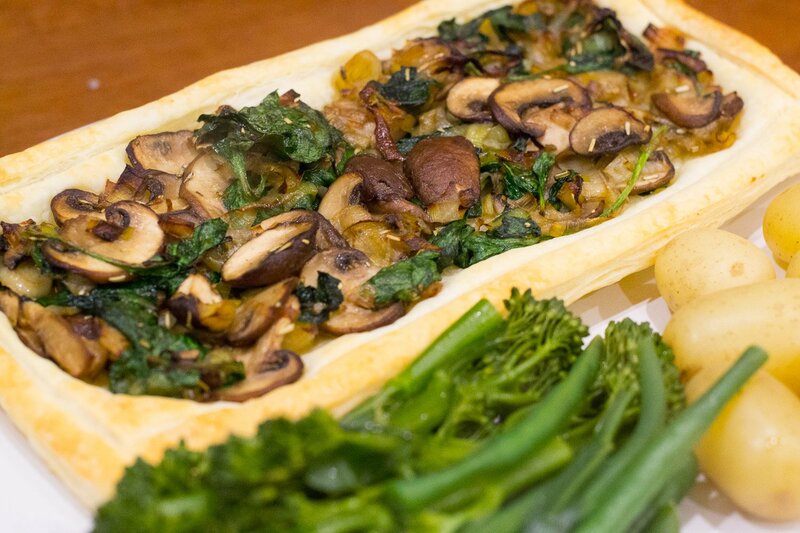 This vegan tart is a great way to use up any vegetables you have in the fridge – you can substitute the leeks, mushrooms and spinach for whatever you have to hand. 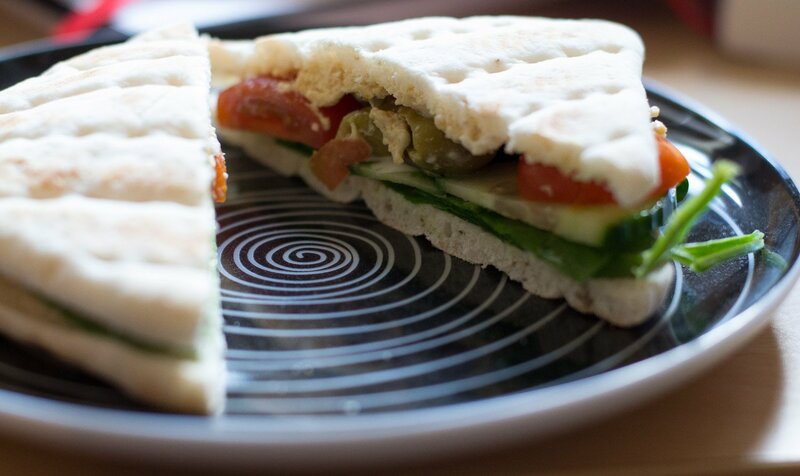 Yesterday’s lunch was a Warburton’s Thin with spinach, cucumber, olives, tomatoes, hummus and vegan mayo. Do you like my new plate? I got it in Tesco for £3. 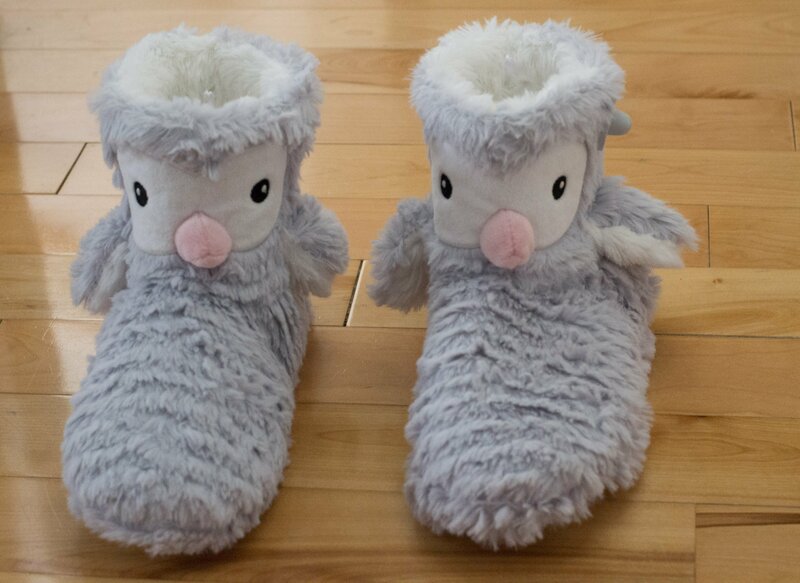 It’s almost as nice as the penguin slippers I also bought (£6). Thanks! I’m going to try and resist putting cheese on everything from now on. Delicious! I bet leaving the cheese off let all that mushroomy flavour shine through didn’t it? It certainly did. It just goes to show that I don’t have to cover everything in cheese! Hope the challenge is going well? It looks like you’re enjoying the culinary challenge, especially without Cheese. Love a mushroom tart! Well done you for doing veganuary. I couldn’t. I need the cheeeeeese! Ssssh, I’m telling myself I don’t! This tart sounds wonderful! I love veggie tarts and every single ingredients that you have used to make this! What lovely and delicious looking tart. That loos delicious, but you had me at mushrooms. Not made a puff tart for ages. A nice reminder. Pinned and stumbled. My tip: stir in some violife vegan cream cheese before baking. So nice! 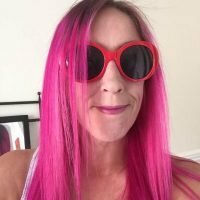 Hi Rosanna, thanks for the tip – I’ll give it a go!